GenealogyBank has been helping millions of family historians discover the stories of their ancestors for over a decade. GenealogyBank makes it easy to document every relative – their genealogical details and their memorable stories – so that their information is recorded and permanently passed down to the rising generation. We have heard your suggestions and have incorporated them into our improved look, being launched today. Technology has changed over the last decade, and these changes let us add new code in the background that allows us to more easily make updates and add even more content to GenealogyBank. 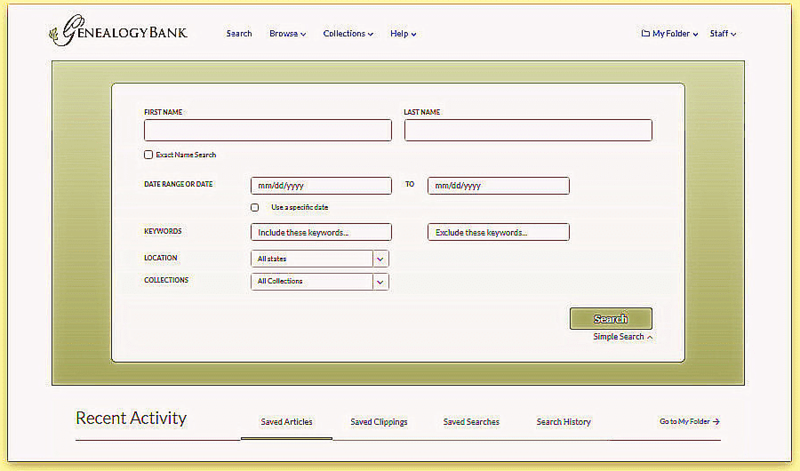 It also makes GenealogyBank easier to use on smartphones and tablets. We are listening – we read every email – and encourage you to send us feedback on these changes and additional improvements you’d like to see. This site-wide upgrade gives you easier-to-use new search boxes and features. More improvements will be released in the days, weeks, and months to come. What Is the New Look? 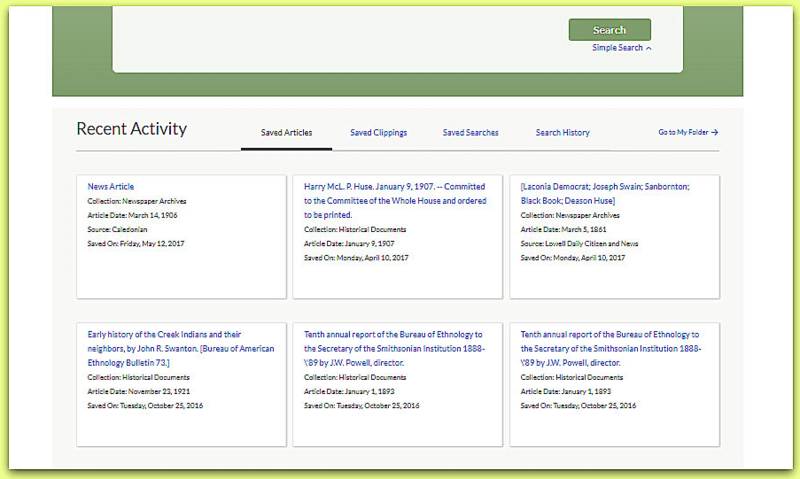 A new easier-to-use, fill-in-the-blank search box: a redesign of GenealogyBank that makes it easier than ever to search, discover and save your discoveries. Notice the handy drop-down menus along the top bar. Use them to narrow your search. Notice the “Saved Articles” button on the Recent Activity line. With one click it opens up your saved articles – so that you can instantly refer back to them. 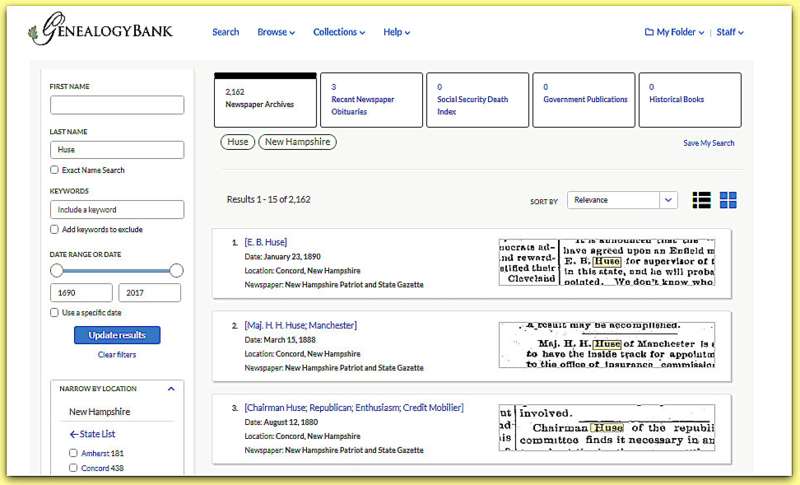 Say I wanted to search for my “Huse” relatives in New Hampshire newspapers. I would type Huse in the search box and use the location dropdown menu to limit my search to New Hampshire newspapers. Note: it is possible to search on several states at the same time. A grid view is the default for viewing your search results; 15 results are shown at a time. 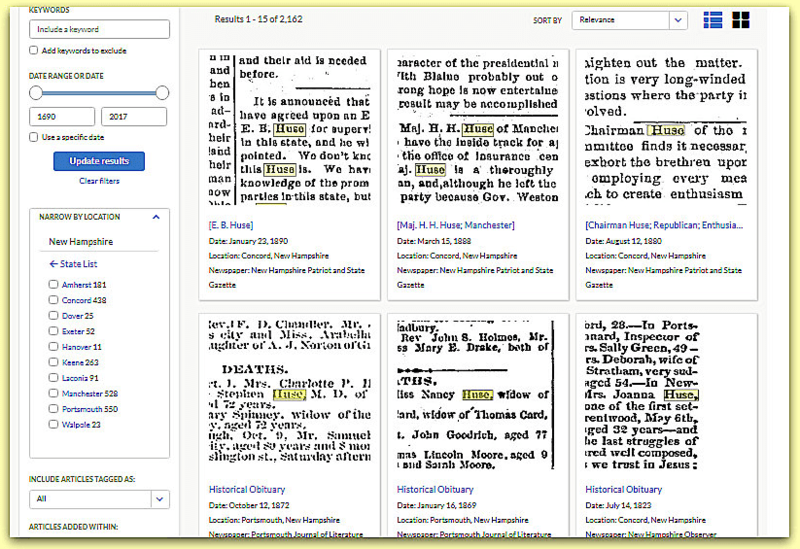 Easy to read – with the handy highlighting of the search term on each article. You can instantly see what the article is about – along with the date, name of the newspaper and citation. Did you notice the blue list icon in the upper right-hand corner? Just click it and the search results are presented as a list. I clicked on one of the articles I wanted to read and it came right up. 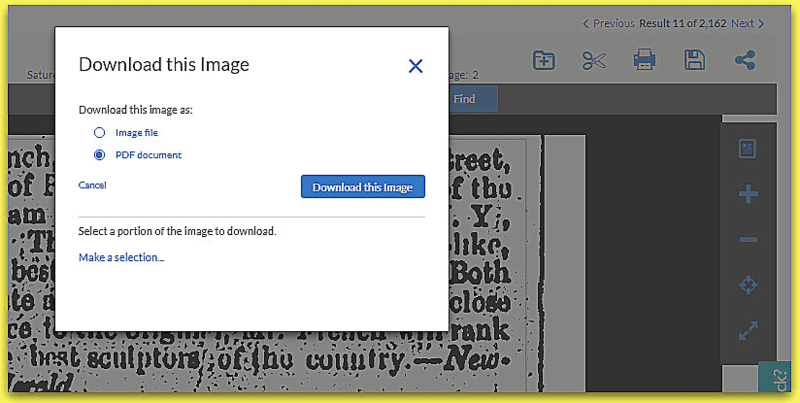 This enhanced image viewer serves up larger images, including a full-screen mode, with new tools making it easier to interact with. 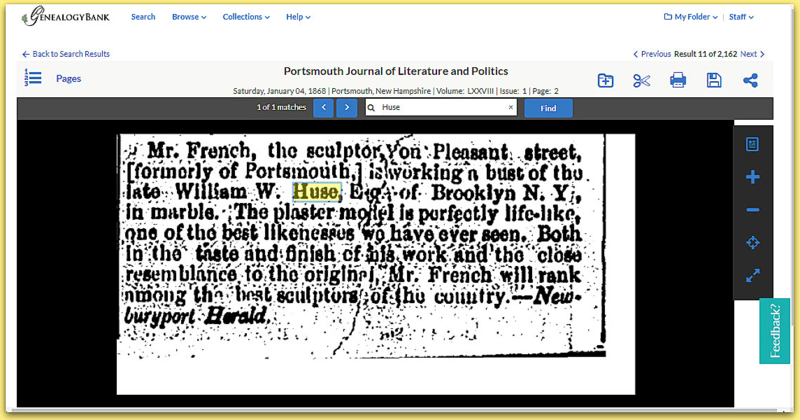 Hey – I didn’t know there was a bust of my cousin William W. Huse – I’ll have to investigate that story. Notice that the newspaper article citation is given at the top of the article. Very handy! It gives me the name of the newspaper; day of the week the article was published, the date, place of publication, the volume, issue number and page number. It is easy for me to copy, cut and paste that information in my notes – another real timesaver. 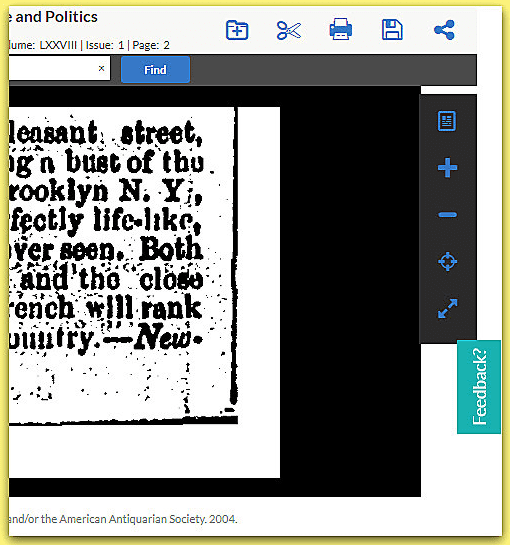 Let’s look at these powerful tools in the enhanced image viewer. This is incredibly easy – what a great improvement. Click on the scissors icon above the clipping. A “Save This Clipping” box appears, letting me give the newspaper article a title and description, saving the clipping to My Folder. Nice. Notice the blue square box framing around the article itself. I can easily drag these lines to exactly frame the part of the article I want to save. I can limit it to the size of the article itself or change the view to full page mode and then “clip” the entire page in these blue square-boxed lines and save the article. This makes it easy to clip the article to remove the extraneous dark spots and lines from the image. Looking again at the icons in the upper right corner – click on the computer floppy disk icon. This lets me save an image of the article as an image file – or as a PDF file. Handy. This feature lets me quickly email a copy of this newspaper article to my relatives interested in our family history. 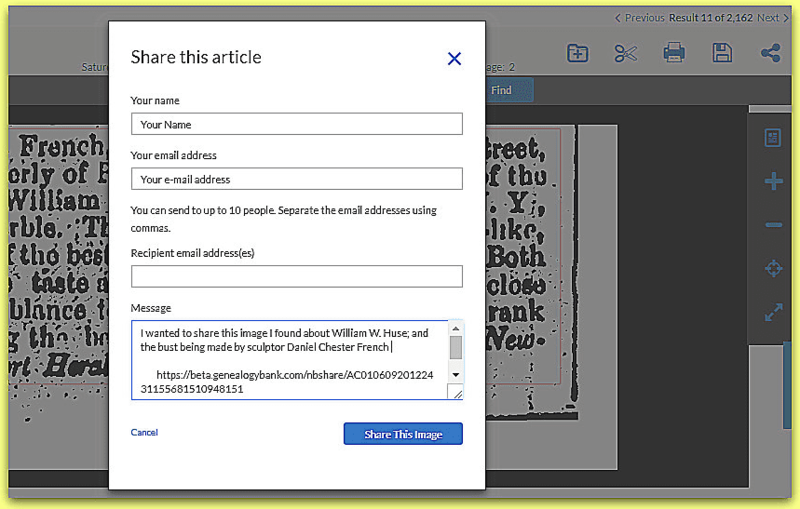 Tip: Everyone you send this article to can view the original image – even if they are not members of GenealogyBank. 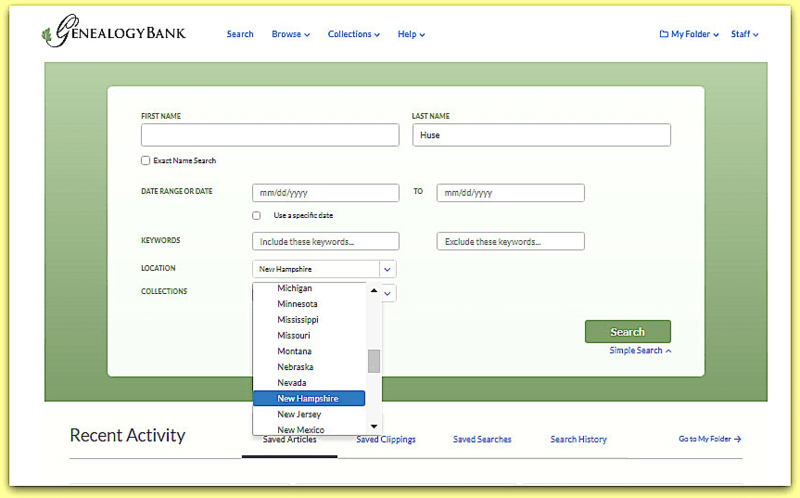 These are just some of the handy new features and enhancements we have made to GenealogyBank. More coming! 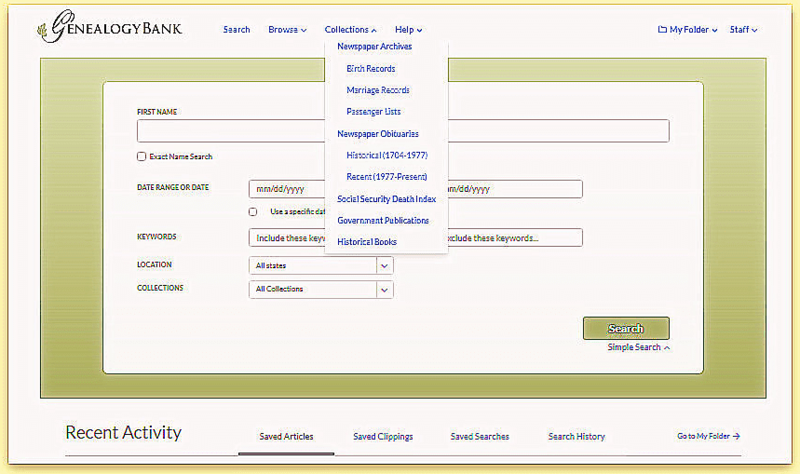 November Update: GenealogyBank Just Added New Content from 17 Titles! Great job. I really like using this to research 18th century New England. I’m so happy to see this new format. I look forward to researching more newspaper articles. Thank you again! You got me. I signed up for a year and I am excited by the improvements since I last subscribed.